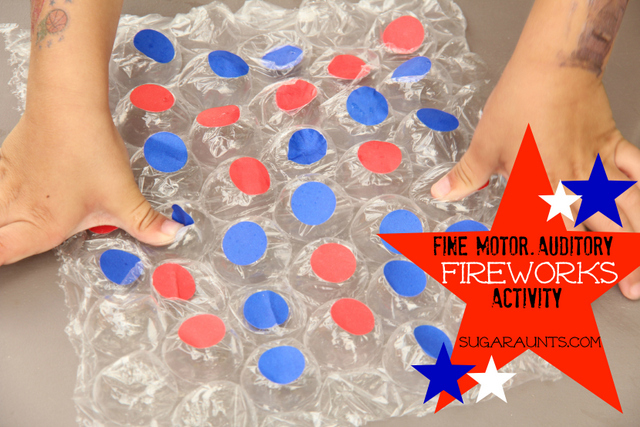 Use this fireworks themed sensory activity to incorporate skills such as fine motor skills, fine motor strength, bilateral coordination, and eye-hand coordination with an auditory processing component that is perfect for the 4th of July, or any patriotic holiday! It uses bubble wrap and red, white, and blue colored stickers to make a sensory tool that kids will love. Happy Independence Day! We had fun one day this week with a quick little festive patriotic fine motor activity. I stuck a bunch of red and blue labeling stickers on large bubble wrap. When Big Sister and Little Guy saw this, they were very excited! The pop made a perfect firework sound for each color. It really did sound like the crack of little fireworks. We did a little listening activity, where I would tell them..."Pop red, then blue, then blue." We did a few patterns and all reds, and then all blues. Each little bubble gave a very satisfying crack!